It’s a good time for the slow-paced adventure game. Sure, the traditional point-and-click genre has been seeing an action-packed resurgence at the hands of Telltale Games, but the slow-paced adventure is evolving too. May 2015 saw the release of Sunset, a quirky tale of Latin American revolution told through the eyes of an American housekeeper, in hour-long cleaning shifts at the end of the day. The tale internally is mundane and domiciliary, while the landscape outside the penthouse apartment’s window changes to reflect the brewing civil war. It’s intriguing stuff. Last week, Everybody’s Gone to the Rapture landed and it’s everything we thought it was going to be. Campo Santo’s artistically astonishing Firewatch is another adventure that we loved at GDC 2015 and are ludicrously excited about – it’s in the pipeline and we’re still hoping to see it later this year. 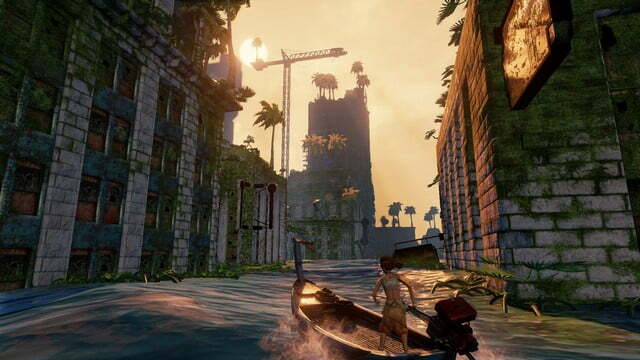 And somewhere in the middle of all that, came a little game called Submerged, developed by indie studio Uppercut Games. You may not have heard of them, but you’ll be familiar with their separate and collective works: The guys at Uppercut Games have worked on Fallout: Tactics, XCOM, BioShock and BioShock 2, to name a few. Not insignificant then, but they’ve not exactly hit upon anything massive since striking out on their own – there have been some interesting mobile takes on the cover-shooter, initially with snowball fights and more recently with mechs – but now there’s Submerged, their first foray into the adventure genre. Let’s get this out of the way early: Submerged is very short – less than three hours for the main story – but that’s not necessarily a bad thing. Now don’t all start jumping up and down, grabbing your pitchforks and running me out of town as a monster. 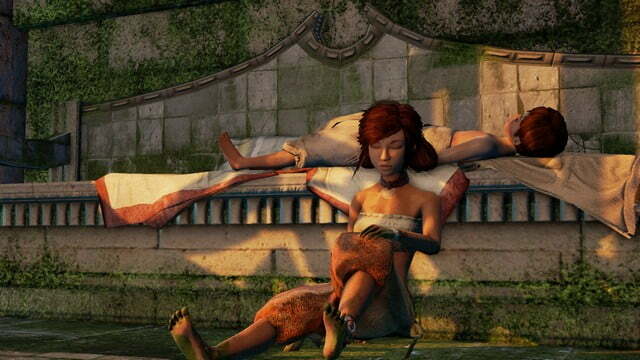 I’m going somewhere with this: Submerged is short because it needs to be. Continue to the end, dear reader, and you’ll see why. Miku, Submerged’s protagonist, is equipped with a telescope. With it you can scan the environment, looking for a hint of something useful. The telescope gives you a little feedback if you’re close to spotting something, and when you’ve hovered over it for a few seconds, it gets added to your map. Getting up higher means you’ve got a better chance of spotting things. When you’ve found a resource you want to head for, it’s time to travel to it using Miku’s small boat, with an even smaller outboard motor. Piloting the little boat is an absolute delight, with the force of the throttle and the pitch of the turning circle combining perfectly for a realistic – and blissfully relaxing – boating experience. Upon arriving at your destination, you’re going to need to climb. The after-effects of the rising sea levels have meant that the tops of buildings protrude from the water’s surface like a swathe of bulrushes, and in order to get anywhere Miku is going to have to scale them – using window ledges, ladders and drainpipes – to uncover their secrets. It’s worth mentioning at this point there’s nothing that can kill you in Submerged. There are a lot of interesting creatures but they’re all basically harmless – birds will scatter as you climb onto their roosting ledges, dolphins will jump and play alongside the boat – and that’s a genuinely nice thing. The first time you see a great whale leap from the water in front of you, it takes a moment to settle yourself. That gamer’s fight-or-flight mechanic kicks in and your finger starts hovering over L2 to start aiming a weapon, but no fight comes. The whale bumbles idly past, and the worst it will do is tip your boat off course a little. It would no doubt hurt if Miku fell from some of the fantastic heights she can climb to, but you can’t die that way either. If you can’t physically make a jump between two ledges, then you can’t actually attempt it. 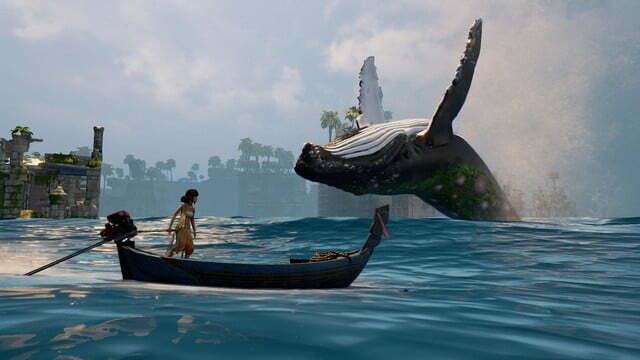 Then it dawned on me: Submerged isn’t necessarily an adventure game at all; it’s actually a puzzler that looks (and more importantly feels) like an adventure. When you’re climbing in Submerged, everything happens in very prescriptive fields of motion. It feels very odd in comparison with the 10-pence-on-the-beachfront viewing feel of the telescope, or the bobbing, dribbly motion of the little boat. Things are meant to be climbed in a certain way, and you can do nothing else but follow the method. Drainpipes and ladders are pretty self explanatory – you can go up them, or conversely, down – and there’s also climbable ivy that adorns some walls (which is also instantly familiar to gamers) but the ledges are a little more variable; you can stand on, or hang from, the ledges in Submerged. Some of them are crumbled and can only be dangled from by your fingertips. Others are more solid, and can be stood upon. That means if you want to go up, you need to find a ledge you can stand on, so that you have something to boost up from. Dangling-only ledges only allow you to move left/right/down, but standing ledges add that important fourth vector – up. This means planning your route can be a little frustrating at times, and can involve doubling-back on yourself or repeating whole sections if you miss an item that you want to go back for, but thankfully the game gives you little visual clues as to where you should go next. In the absence of a comforting “There’s new enemies down here, I must be going the right way” logic to it, Submerged points the way with red flowers, falling petals, fireflies and red fabric hanging from balconies. In a world of blues, greens and browns, red lights the way like a beacon. It’s echoes of 2001: A Space Odyssey but here, red is a very good distinction in colour. When you do follow the trails of red, invariably to the top of a very tall building with a lot of complex climbing, you’ll find what looks like the remains of an air-drop of supplies. Most of the boxes will already be opened and cleaned out, but there’ll always be one pristine box, containing something you need to save your brother. In a nice touch, the thing you need next – bandages, painkillers, fresh water, whatever it may be – is always in the next red box you open. You don’t have to tour around eight tall buildings until you find the right item you brother needs at that particular moment in time; this shrewd move has definitely saved Submerged from turning into interminable, repetitive fetch-quests. As you work your way through the red box collections in Submerged, you unveil cave-painting-esque pictographs that reveal how your little brother came to be wounded. It’s a sad story and an interesting way to deliver it, but there’s always a slight feeling of it being Miku’s motivation but not necessarily yours. In an interesting moment of self-realisation, the idea that we’re collecting boxes because that’s what games have always needed us to do is a hard one to shake. You’re also collecting pictographs on how the city – and presumably the world – came to be in the state that it is, and filling your journal with the story. There’s also propeller upgrades for the boat (which allow for fun little speed boosts) and the chance to categorise some of the landmarks and sea-creatures you see on your travels, which make for a nice diversion. It’s a reason to do a bit more exploring (and can be continued once the main quest is over) and it can lead to some truly stunning views – climbing up an enormous crane landmark is a particular highlight – but it can get a little repetitive. There are sixty pictographs of the city’s story, and you can probably work out what happened after about a dozen. As you collect the red boxes your brother’s condition stabilises and slowly improves, but as you spend more time foraging through the ruins, Miku becomes sicker. What begins as a little cough turns quickly into a spreading disease, that sees Miku passing out from exhaustion at the end of every day. You might have started out as a pre-programmed box collecting machine, but that rapidly escalates into the realisation that Miku is sacrificing her own well-being for the sake of her brother. All of a sudden, you’re caring. After 2-3 hours of solid gameplay, the main story is finished – I did warn you that it’s short – but it really doesn’t need to be any longer than that. 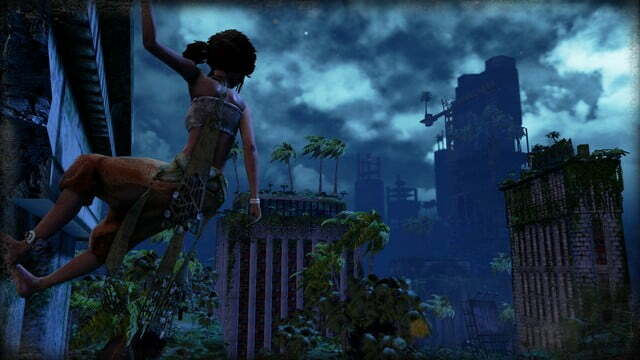 Submerged is the perfect length to enjoy in one sitting, before the gameplay (specifically the climbing/puzzling mechanic) has any opportunity to get stale. If you do want to continue on you could easily squeeze another 3-4 hours collecting all the pictographs, but it feels like the focused delivery of a gorgeous snippet, a fragment in time that never overstayed its welcome. You don’t need to collect everything, though. You don’t need to 100% Submerged, short as it is, to feel like you got value. Just spending a little time in Submerged's world is a joy because – and I might've forgotten to mention this bit – it's absolutely bloody beautiful.